Diagnosing issues with your computer efficiency can be difficult. Businesses increasingly rely upon fast, efficient computing power to provide good customer service and accomplish crucial tasks. But when these computers begin to slow down, it can cause severe problems for employee productivity. Even small interruptions, if they happen frequently throughout the day, can add up. And a program that takes a while to launch, or files that take a long time to open or save, can disrupt a person’s workflow and increase the likelihood of that person becoming distracted instead of sticking to the task. For these reasons, when a computer starts to slow down, it’s important to diagnose the issue right away so that it can be promptly taken care of. 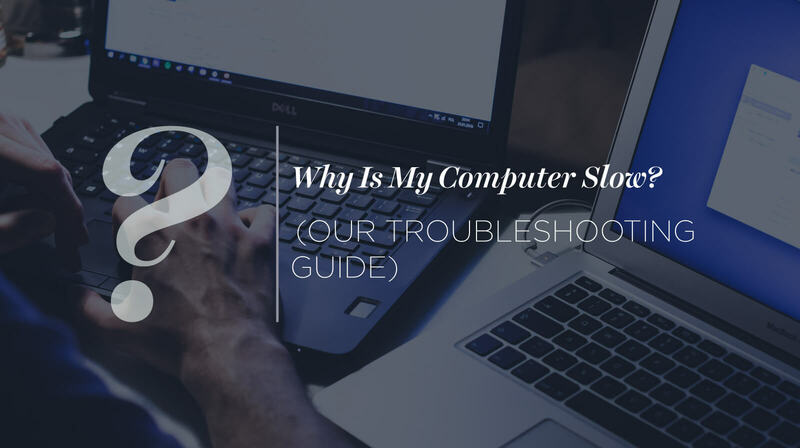 Here are the top reasons why your computer could be running slow. If it’s been a while since you shut down your computer, it may just need a restart. Computers can get sluggish after a while due to background programs taking up processing power and delayed updates slowing down the system. A restart will help resolve some of those issues. You’re running out of hard drive space. You need to have about 20% of your hard drive free to allow for temporary file storage. Less than that, and it grows difficult for your computer to move files around and opperate more efficiently. You can think of it a little like a store room. If you pack the space full, it will be harder to access items without shifting items around. And in order to shift those items, you need space to set them. Free space on a hard drive fulfills a similar purpose, so if you’re running out, then your computer will struggle to complete tasks. You have a corrupted or fragmented hard drive. Hard drives can become corrupted after an improper system shut down. If your computer loses power suddenly or undergoes a hard restart, it can lead to problems down the road. You can run a disk scan to see if your hard drive has been corrupted, or include this in part of your regular systems monitoring with your IT team. Fragmentation is another issue. Your computer operates at peak efficiency when its data is stored in an orderly way. But, as files are moved, edited, created, and deleted, the data gradually becomes disorganized. Modern hard drives usually defragment themselves, but if you have an old system or have just imported a large number of files, it may be worth checking. It’s been a while since you ran a system update. Many of us fall into the habit of delaying important systems updates because we’re busy and don’t want the interruption. But putting off the update not only leaves you exposed to potential computer virus threats, it also means those programs are likely to be running at sub-optimal efficiency, and possibly slowing other programs down in the process. You’re running too many programs and are low on memory. How many programs do you launch at startup? How many do you run during the day? Many of us have a set list of programs we use almost continuously throughout our work week, but it’s easy to leave non-essential programs running, just because we forget to close them. And even when these programs are closed, they may continue running tasks in the background. If you notice your computer running slowly, try to limit the number of programs you launch at startup, and be more proactive in closing others after you finish using them. You’re running two antivirus programs and they’re at war with each other. Antivirus programs are intentionally built to be hard to uninstall to prevent viruses from doing so the moment they infect a machine. But this can lead to problems if you try to switch antivirus software. If you don’t properly uninstall a program, it could start interfering with your new software, possibly preventing both from effectively stopping viruses and slowing down your computer in the process. Your programs are out of date. As your computer continues to update, old programs struggle to keep up performance. After a while, new systems stop supporting them, and they cease functioning altogether. If you’re experiencing a slowdown, it could be your software that’s at fault rather than your computer. Your hardware is out of date. On the other hand, old computers can fall behind software requirements, too. A new piece of software installed on an old device can cause problems if the old computer doesn’t have the power to keep up with it. In this case, it may be time to replace your computer. The added expense will be well worth the gains in productivity. You have a computer virus or malware. Viruses and malware often run in the background of your computer, taking up your hard drive space and consuming processing power. While some viruses quickly make themselves known through suspicious activity, many try to keep a low profile to avoid detection. Running a virus scan can locate these programs and remove them so that they will stop leaching your computer’s resources. If you’re having problems with slow computers, it may be time for managed IT services. All the issues we discussed above can be managed through an IT partner, often remotely. At Brightline, our Remote Monitoring and Maintenance (RMM) services allow us to keep an eye on your computer performance, run system updates, and detect suspicious activity in case your system becomes infected by malware. We can also assess your current hardware and software needs, made recommendations about upgrades, and help develop a replacement schedule so that you can plan for future costs. If you would like to discuss these services, contact us today.